According to the Pentagon, China has started to place multiple independently targetable re-entry vehicles, or MIRVs, on its DF-5B missile. It might place MIRVs on the DF-41 as well. India and Pakistan may well follow China’s lead. The advent of multiple warheads in Asia will not be as pernicious as it was during the Cold War because Beijing is unlikely to discard its nuclear doctrine of assured retaliation against cities in favor of a nuclear warfighting strategy that focuses on military targets. Nevertheless, China’s adoption of multiple-warhead missiles could have negative repercussions, depending on the scope and pace of their introduction. Countervalue targeting against cities is abhorrent on humanitarian grounds. Counterforce targeting against military targets leads to very large nuclear arsenals, which are also objectionable on humanitarian grounds. The first coming of MIRVs, reinforced by increased missile accuracy, enabled counterforce strategies, which drove up targeting lists. The ensuing arms race made a mockery of the Strategic Arms Limitation Talks. At the end of the Cold War, the United States and the Soviet Union together possessed 30,000 warheads. Some China watchers have speculated that the induction of MIRVs into the Chinese nuclear arsenal presages a sprint to catch up with the United States and a shift to counterforce targeting. This mirror-imaging of U.S. and Soviet behavior during the Cold War seems far-fetched for a number of reasons. First, as Jeffrey Lewis argues persuasively in The Lure and Pitfalls of MIRVs: From the First to the Second Nuclear Age, Beijing has a history of developing new technologies and capabilities without embracing them fully. Second, the whole point of counterforce targeting is to destroy – or at least severely degrade – an adversary’s ability to retaliate. If Beijing wished to pursue such a strategy against the United States, it would need to mimic Soviet behavior. Instead, Beijing seems committed to what it terms a “lean and effective” nuclear arsenal, eschewing robust nuclear capabilities as a distraction from the promotion of economic growth. Other factors militate against China embracing a counterforce targeting with aggressive MIRVing. One major check is the size of its nuclear warheads. Developed in the 1990s before the Comprehensive Nuclear-Test-Ban Treaty (CTBT) went into effect, China’s smallest warhead weighs about 500 kilograms (kg). The silo-based, liquid-fueled DF-5B – the only multiple-warhead missile Beijing has deployed thus far – has an estimated throw-weight – or lifting power – of 3,000 kg. 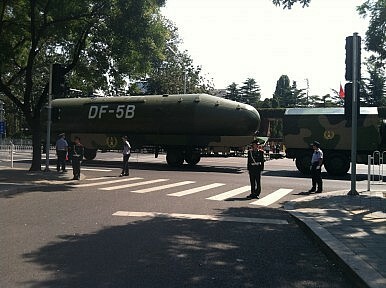 It would be hard for China to fit more than three 500-kg warheads plus a 1,500-kg post-boost vehicle on the DF-5B. To add more warheads to this missile, China would need to develop smaller warheads, a challenging feat as long as Beijing adheres to the CTBT and refrains from testing new warhead designs. More stringent constraints apply to the mobile, solid-fueled DF-41, which the Pentagon sees as MIRV-capable. The development of the DF-41 is in line with China’s interest in fielding more survivable nuclear forces, as mobile missiles are more difficult for enemy forces to track and target. Enhancing survivability, however, comes at the expense of missile size and throw-weight. Some journalists, citing sources in the U.S. intelligence community, have claimed that the DF-41 might be able to carry between six and 10 500 kg warheads, numbers that would require throw-weights in the 4,500-7,500 kg range. Since other modern mobile missiles – such as the Russian SS-25 (Topol) and SS-27 (Topol-M) – have throw-weights in the 1,000-1,200-kg range, these reports are not convincing. MIRVs are but one option for countering America’s nascent ballistic missile defense (BMD), which seems to be the primary catalyst of China’s MIRVing. Beijing probably will invest heavily in anti-BMD technologies also in order to have confidence in its ability to overwhelm U.S. missile defenses. China’s reported flight-testing of a hypersonic glide vehicle may be part of this strategy. The same goes for its efforts to acquire the technologies associated with maneuverable re-entry vehicles, decoys, and other penetration aids. A limited deployment of MIRVs along with other countermeasures would be consistent with Beijing’s twin desires of preserving a cost-effective nuclear doctrine and penetrating U.S. missile defenses – and this appears to be what is unfolding. China’s warhead stockpile will grow because of MIRVs and other modernization programs. China possesses about 20 DF-5 missiles in total: half of which are DF-5As and half of which are MIRVed DF-5Bs. The induction of the DF-5Bs into China’s missile force has resulted in an approximate net increase of 20 warheads. Should Beijing retire the DF-5A in the next 10-15 years and deploy more DF-5Bs in their place, an additional net increase of 20 warheads is conceivable, resulting in a total net increase of 40 warheads from MIRVing the DF-5 series. If the DF-41 is capable of carrying two warheads, the deployment of 30 missiles over the next decade and a half could lead to 60 additional warheads. In other words, MIRVing land-based forces at these rates would leave China with approximately 100 additional warheads or a stockpile increase of 40 percent compared to today’s figures. Compare this with the thousands of MIRVed warheads the United States and the Soviet Union deployed, and China’s deployment of multiple-warhead missiles is likely to be modest and far from the “sprint to parity” some dread. Even so, MIRVs could have cascading effects in southern Asia. New Delhi might pursue BMD and multiple-warhead missiles in response to Beijing’s moves, which could cause Rawalpindi to double down on what some experts have deemed the world’s fastest-growing nuclear arsenal. In order to avoid the action-reaction dynamic in which the Americans and the Soviets became entangled and avoid a destabilizing arms race, Chinese and Indian leaders, in particular, would do well to reaffirm their “no first use” doctrines, to deploy multiple-warhead missiles in modest numbers, and to be more transparent with each other about the true drivers of their strategic modernization programs. Above all, Beijing and New Delhi would be wise to resist the lure and pitfalls of counterforce targeting. Travis Wheeler is a Research Associate in the Stimson Center’s South Asia Program. He was co-editor of the recently released book The Lure and Pitfalls of MIRVS: From the First to the Second Nuclear Age.